Click here to view the Namgis First Nation website, for additional information. For public safety purposes, during the rainy season the campground is closed and the gate at the park boundary is locked, from November 1 to April 1. Also note, the campground will be closed if rainfall exceeds 100mm in a 24 hour period. Warning signs are posted in the park. With its superb scenery and countless opportunities for wilderness hiking, backpacking, boating, fishing, swimming and camping, Schoen Lake is one of the most beautiful parks on Vancouver Island. Located northwest of Campbell River in the Nimpkish Valley, Schoen Lake is a little more primitive than some parks, but the chance to view nature in all its glory more than makes up for the lack of modern amenities. You’ll find peace and quiet at your campsite in this wilderness park - one of the few that offers vehicle-accessible camping on northern Vancouver Island. Within the park’s protective boundaries are old-growth forests, waterways, meadows, small lakes and essential deer, Roosevelt elk and fish habitat. Schoen Lake campground is closed annually from November 1 to March 31, due to the potential hazard of slides from winter storms. The gate at the park boundary will be closed and locked. The campground will also be closed if rainfall exceeds 100mm in a 24 hour period. Off-season from October 1 to May 14 with no services provided; self-sufficient. Schoen Lake Provincial Park is located 140 km north of Campbell River on Vancouver Island. Access to the camping area is via the gravel Davie Road, approximately 12 km off of Hwy 19, past Sayward. 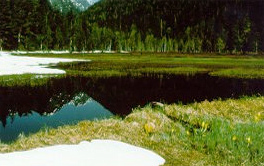 The Nisnak Meadows area at the east end of the park can be reached via the upper Adam Road. Both roads can be rough and logging vehicles are common. Nearby communities include: Woss, Port McNeill, Sayward. History: Formerly a Canadian Forest Products recreation site, Schoen Lake Park was established in 1977 to protect and preserve natural values including representative landscape of the Vancouver Island Mountains, significant stands of old growth forest and Roosevelt elk. Additional parkland was added in 1995. This section is referred to as the Davie River addition (259 ha). Conservation: The primary role of the Davie River addition is to protect old-growth forest values on a steeply sloping ridge, which is a significant portion of the viewscape for park visitors approaching from Highway 19. The area also protects glaciers, waterways, meadows, small lakes, and essential wildlife habitat for deer, elk and fish. Wildlife: The area protects wildlife habitat for deer, elk and fish. The approved Management Plan [PDF] for Schoen Lake Provincial Park is available in PDF format. There are canoeing and kayaking opportunities at this park in 5-km long Schoen Lake. Paddlers can set in at a rough boat launching area, located at the Schoen Lake campsite. Bicycles are only permitted on park roads. Bicycle helmets are mandatory in British Columbia. Campers and day-use visitors can enjoy angling for lake trout in Schoen Lake. Anyone fishing or angling in British Columbia must have an appropriate licence. There are no maintained trails in this park, however there are some rugged, unmarked routes that offer hiking opportunities. Routes include the Schoen Creek Trail from the Davie Road campground and the Nisnak Lake Trail. Or set your sights on 1,802-metre Mt. Schoen, a climb that will reward you with panoramic vistas of the lake and surrounding area. There is no designated swimming area at this park, however visitors do swim in Schoen Lake. Caution: Near the campsite is a log jam covering the outflow of Schoen lake flowing into the Davie River; swimmers should stay clear of this log jam as it is unstable and currents can be unsafe. There are no lifeguards on duty at provincial parks. This park offers potential for backcountry skiing and snowshoeing in the small sub-alpine area located 3 km north of the campsite. This area can only be accessed via Western Forest Products logging roads from the Mt. Cain road. This park has a rough boat launching area for car-toppers located at the Schoen Lake campsite; a four-wheel drive vehicle is recommended. While fires are allowed, we encourage visitors to conserve the environment by minimizing the use of fire and using stoves instead. Campers must use fire rings provided at each campsite. To preserve vegetation and ground cover, please don’t gather firewood from the area around your campsite or elsewhere in the park. Dead wood is an important habitat element for many plants and animals and it adds organic matter to the soil. You can conserve firewood and air quality by keeping your campfire small. Limited burning hours or campfire bans may be implemented. Be prepared to bring a portable stove for cooking. There is a small day-use/picnic area in the park next to the boat launch. There are two pit toilets available in the park, located in the centre of the campsite. This park offers 9 vehicle-accessible campsites on a first-come, first-served basis. All sites are located close to the lake and no facilities are provided other than pit toilets. Campsite reservations are not accepted. BC Senior’s Rate (day after Labour Day to June 14 only): $5.50 per senior party/night. Read the User Fees Policy for information on Senior Camping Discounts. From June 15 to September 15 the on-site park facility operator collects campsite fees, and during other times campsite fees are collected by a self-registration system at the park. The campground is closed and the gate is locked from November 1 to March 1. Typically the access road to the campsite is impassable due to snow from late December to late March. Wilderness, backcountry or walk-in camping is allowed, but no facilities are provided. The most popular spots are Schoen Creek, Nisnak Creek and upstream from Nisnak Creek toward Nisnak Meadows. Access to Nisnak Meadows is via an unmarked and unmaintained hiking route. Please practice “Leave No Trace” camping ethics. For public safety purposes, Schoen Lake campground is closed and the gate is locked from November 1 to April 1, due to the threat of slides during the rainy season. Typically the access road to the campsite is impassable due to snow from late December to late March. There is no winter camping fee.